This V30 gaming mouse adopts new ergonomic design, which is very comfortable for using. It has colorful breathing light and quick reaction. Designed for game, it is your good choice. You will not regret for having it. 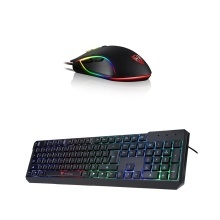 The 104 keys QWERTY gaming keyboard, multiple water outlets design at the bottom of the keyboard for water draining, fully backlit colorful LEDs system and keystrokes life up to 10 million times, more durable.